Raiders Jack Wighton and Bill Cullen launching the Raiders Pet Program. Photo: Supplied by Canberra Raiders HQ. The Canberra Raiders launched their official Pet Program in partnership with RSPCA ACT on Monday (4 December), giving members and fans the opportunity for their pets to be part of a day at the footy. The partnership also assists the RSPCA in their protection of the welfare of animals, with $20 of the sign-up fee of $45 pledged towards the RSPCA to help continue their care for animals. Raiders stars Jack Wighton and Bill Cullen signed up their pets for the program, with Jack’s dog Bella and Bill’s parrot Zazu the first to join up. 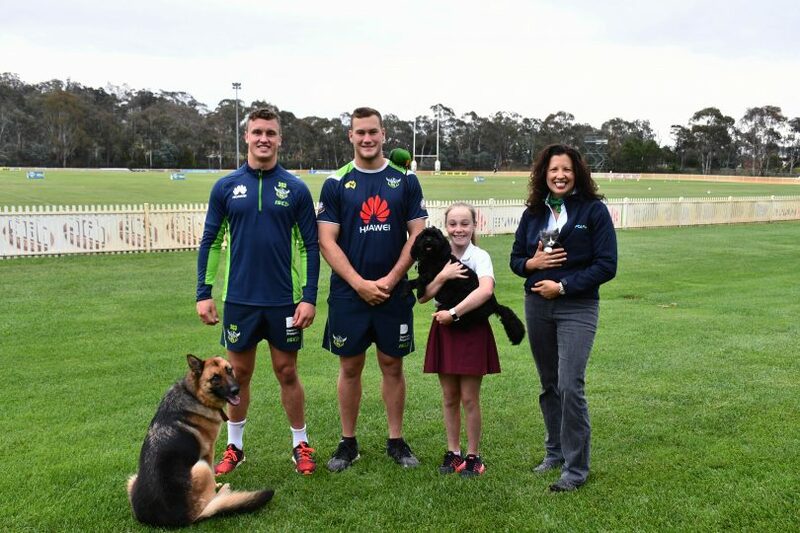 Wighton said the Pet Program was a great way for the public to show their support for the Green Machine while at the same time helping a very worthwhile cause. “It’s great to have Bella as an official supporter now and this is a great way for Raiders fans to get their pets involved in footy,” Wighton said. CEO of the RSPCA ACT Tammy Ven Dange said that the RSPCA ACT was excited to be part of the Raiders Pet Program and the money raised through the program would help them continue to care for animals in the ACT. “We’re thrilled to be a part of the Raiders family and are delighted that they have embraced every member of the family including the pets,” Ms Ven Dange said. The Pet Program also includes a Raiders ID tag, drink bottle, bouncy ball, pen and personalised Raiders card. People can sign up for the Pet Program now via the Raiders membership website. Will you bring your pet to the footy in the upcoming season? Give us your opinion in the comments below.